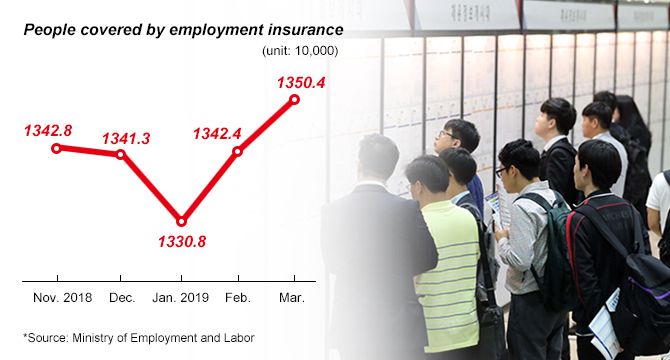 The number of people covered by state-run employment insurance showed the sharpest increase in South Korea in seven years in March thanks to the government’s pro-labor policy to enhance welfare of the workers. The Ministry of Employment and Labor announced Monday that the number of people holding employment insurance coverage rose 4.1 percent in March to 13.5 million from the same month a year ago. The figure added 530,000 from the previous month, the fastest growth since February 2012. “The growth rate in the service sector including healthcare and welfare, food and lodging and public administration was the highest in nine years and four months,” the ministry said. The steep rise was driven by the government’s policy to expand the coverage to workers who had not been adequately covered by employment insurance, particularly service sector workers and female employees. But the number declined in the nation’s key industries such as manufacturing, automobile, shipbuilding and telecommunications, suggesting that the country’s job market is still struggling to add high-paying, quality jobs. The increase also accompanied the rise in fresh applicants for job seeking allowances, a type of unemployment benefits subsidized by the government for people who lose employment insurance benefits due to unemployment. The number of beneficiaries of the jobseeker’s allowance grew 11 percent from the previous year to 506,000 in March. The government last month paid out 639.7 billion won ($559.8 million) to the jobseekers, soaring 23.1 percent on year and the highest monthly payment on record. The number of people receiving the state subsidies and the government payment are expected to continue to increase as the government has vowed to strengthen social safety net for the unemployed.